On Episode 19 of the Khandaan podcast, we continue our limited edition run of favorites with everybody’s preferred incendiary film critic, Raja Sen. A reviewer with Hindustan Times and the author of a children’s book based on The Godfather (! ), The Best Baker in the World, Raja has chosen Mani Ratnam’s Dil Se (1998) to discuss. Celebrating its 20th anniversary this year with a brand new restored print available on Netflix, this movie threw up some interesting reactions on the panel. Raja maintains that this is Shahrukh Khan’s best and most natural performance to date, but Sujoy and Amrita had issues with the film on a personal and political level. Asim was too dazzled by Preity Zinta to care. 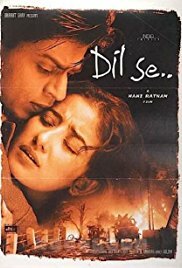 Starring Manisha Koirala as a beautiful young terrorist from India’s Northeast, SRK as a radio journalist, and Preity in her breakout debut as the fresh young thing next door, Dil Se has garnered quite a reputation over the years even though it underperformed upon release. We discuss this phase of SRK’s career, our issues with the performances, and of course no episode of Khandaan is complete without a little gossip. We also discuss some of the new releases over the past fortnight – from the Spiderman video game to Stree, which is garnering stellar reviews (including one from Raja). We also touch upon Amazon’s Jack Ryan, a series that Asim and Amrita took serious issue with. 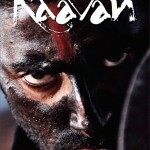 Mani Ratnam is pretty much how I expected him to be – unpretentious, likeable and a man who doesn’t waste words. When he does speak, there was much to inspire and after the hour and bit talk, I am sure I was not the only who felt charged up to go out and make a film of my own. With an audience that included Ratnam’s wife Suhasini (an accomplished actress in Malayalam, Tamil, Telugu and Kannada language films) and ace cinematographer Rajiv Menon (who was sat next to me with his wife and Suhasini next to her), the talk was guided by Peter Webber (director of Girl With A Pearl Earring and all set to make his next venture in India) and held at the BFI Southbank which was the perfect place to host this afternoon event as part of the London Indian Film Festival 2015. When asked about how he became a filmmaker, Ratnam described himself as a “disillusioned management consultant” who was passionate about cinema and wanted to see if he could make a career out of filmmaking. When Webber asked him if anyone had influenced his work, Ratnam mentioned Akira Kurosawa as a favourite but admitted he was generally inspired by anything he had read or seen (as indeed all creatives are). There was also some good natured ribbing about songs in Indian cinema with Webber saying he admired Ratnam and Indian filmmakers for directing songs in their films. Ratnam explained how directing a song was a “liberating process” and was like making a mini film, with a story arc, choreography and sensibility all of its own. “Songs let you travel emotions in an abstract fashion” said Ratnam before joking that he felt sorry for Western cinema that does not have songs as part of its narrative. Ratnam also spoke about his working relationship with A R Rehman who has scored the music for many of Ratnam’s films. Naming Bombay as his favourite Rehman soundtrack, Ratnam noted that Rehman was a very special composer who had a unique ability to find his own level in his music as well as achieving what had been asked of him when composing music and that the experience of working with him was a great one. I was not surprised but interested by Ratnam’s revelation that he doesn’t really understand Hindi in the way he does Tamil. Ratnam went on to explain how he wrote in Tamil, then worked with a Hindi writer to translate the dialogue and then trusted his actors to enact their character properly as Ratnam felt he is unable to control nuances of word in Hindi as well as he would want to and for this reason preferred to work in Tamil. Webber then took questions from the audience which ranged from what Ratnam does to make a set come alive (“have a good team and work with people better than you”), his inspiration for the strong female roles in his films (all based on the women he has met and his admiration for their amazing strength in character), his favourite director (“Guru Dutt”) and how he offered his first film to his wife but she refused it (“so I married her!” which delighted the audience). 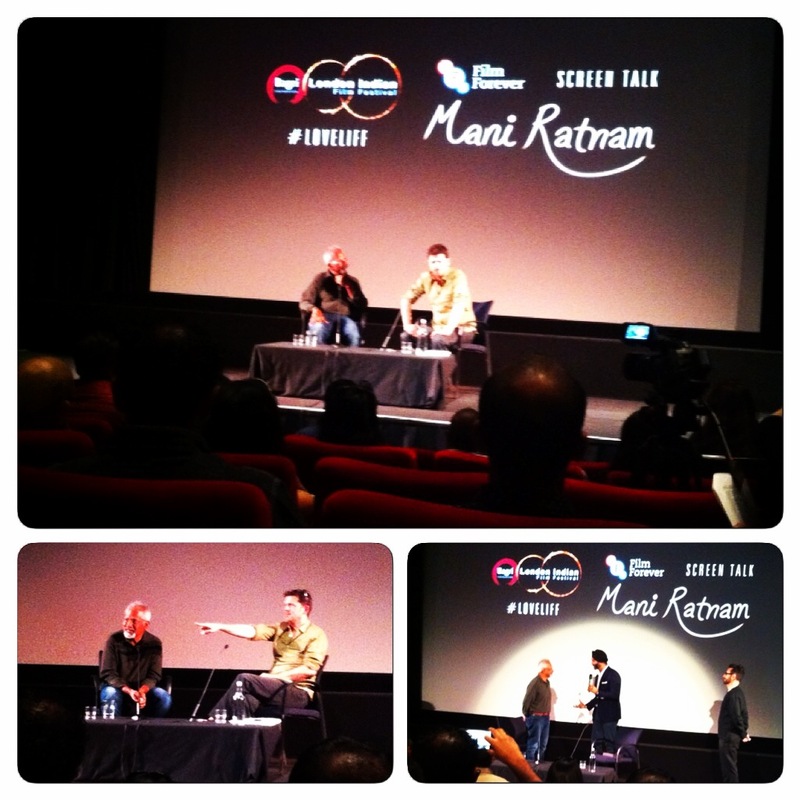 All too soon, time was up and Ratnam was presented the London Indian Film Festival icon of cinema award, the first ever recipient of the award to mark the conclusion of the talk. My favourite anecdote came near the start, where Ratnam talked about how he saw his approach to film as “reinventing what is written on paper”. A simple sentiment that could easily be lost in the process of filmmaking, it struck me that this was exactly what Ratnam has done in each of his films and perhaps is instrumental in making him one of Indian cinema’s greatest filmmakers and a very worthy candidate for a truly fascinating screen talk. 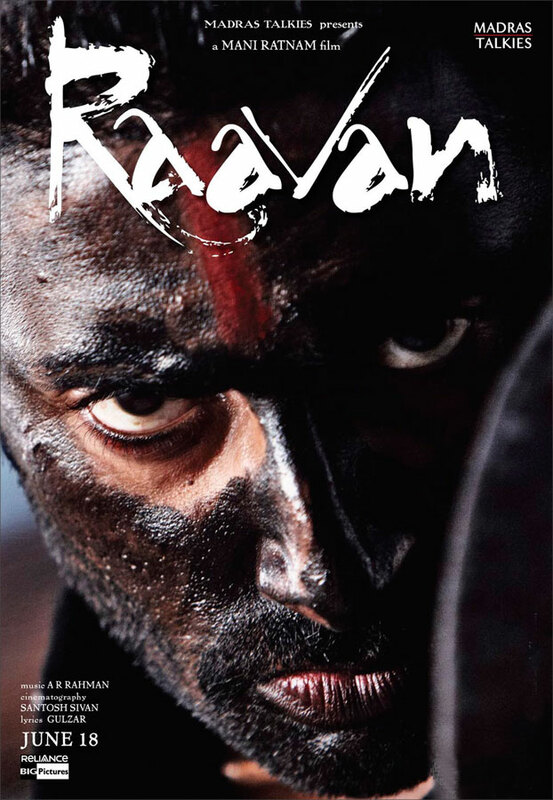 Fresh off the presses Abhishek bachan has just tweeted the new teaser trailer for his upcoming movie Raavan. It’s directed by acclaimed south Indian director Mani Ratnam after their awesome collaboration in Guru.Â It also stars the wonderfully effervescent Aishwarya Rai of which we only see a passing shot. Watch it here now before it get’s pulled by the man!